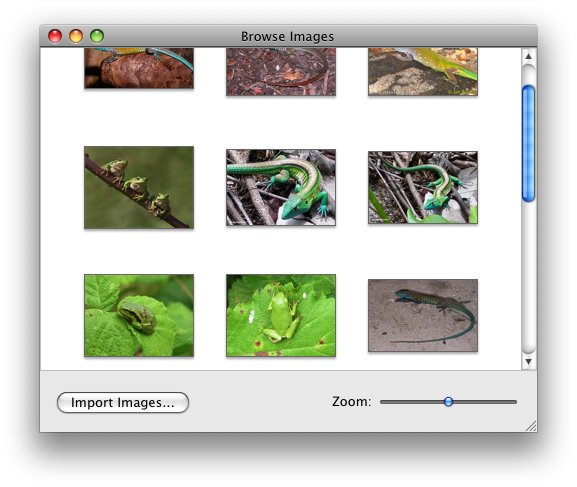 After listening to Frasier Speirs on Late Night Cocoa, I decided to take a look at ImageKit, a new Leopard-only technology that contains the most interesting parts of iPhoto. All done? Great. I wanted some extras in “Browse Images”, for example a slideshow and a filter. There is a guide to build a slideshow application, but it makes you write a separate application. We already have “Browse Images”, surely we can re-use it? The only difference is the objects returned by (id) imageBrowser: itemAtIndex: had to implement the IKImageBrowserItem protocol, but they still returned an NSString*, a path to the image file. return [[mImages objectAtIndex: i] path]; // path? Where did that come from? Create a button in Interface Builder, and Control-drag it to your controller to connect it to the startSlideShow: action (IB 3 should have automatically picked up the change in your header file and offer you the new action). Build and run. 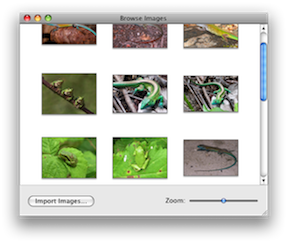 You should be able to browse pictures like before, and pressing on the “Slideshow” button should start a full-screen slideshow, complete with index sheet. If you are on Twitter, chances are that you have one avatar that you never update because there is nothing in Twitter’s API to access that part of your profile. I have written a pair of script for Acorn that will allow you to do this. Warning:I have tested this on Leopard 10.5.2, with ruby 1.8.6. It works for me. YMMV. The archive contains a python script (which Acorn will load) and a helper ruby script to do the heavy lifting. Important! Customize the Twitter.py script with your twitter username and password. Maybe I will update the script to have a real UI for this, or simply use the keychain. This is a quick-and-dirty hack. Launch Acorn. Open an image. Edit it (crop it, etc…). You should be able to send it to Twitter by selecting File->Actions->Save as Twitter Avatar (by default, Control-Command-T). That’s it! Share and enjoy!